It’s getting to be that time of year when sickness prevails and colds and coughs become commonplace. Without remedies on hand, it’s going to be a long sick season for you and your household, so we’ve compiled some of the best natural remedies for congestion so you can get back to your healthy self as soon as possible! If you’re dealing with colds, chest and sinus congestion, check out how to stop them in their tracks for your healthiest sick season yet! Although congestion isn’t an illness in itself, it can come from other illnesses like cold or flu. It can also be a reaction to something in the environment. You may notice you get congested when you have allergies or even pressure in your sinuses, but the question stands: What actually causes congestion? You become congested when the lining in your nasal passages becomes swollen. The swelling can stem from an irritation due to a virus, bacteria, allergen or other foreign substance. If you’ve noticed you produce more mucus when you’re congested, that makes sense too. Mucus production occurs when your immune system senses a threat, which comes from a virus, bacteria or allergen. Is it a Cold or Something More Serious? Colds are common when the weather starts to cool down, but do you know how to tell the difference between the common cold and something more serious? Some people think they have a cold when they really have a medical condition like the flu, strep throat, or even mono. Here are 5 symptoms that signal you’re dealing with something more serious than a cold. It’s not very common to have a fever with a cold, especially if it’s a high one at 101 degrees fahrenheit or above. Cold symptoms along with a high fever can signal strep throat, so you should get yourself checked right away. One of the best feelings is to recover from a cold, but if you notice your symptoms come back shortly after, it could be signs of a superinfection. Superinfections can include strep throat, pneumonia, and sinus infections, so they should be dealt with as soon as possible! It’s normal to have a cough when you get a cold, but if your cough is causing you chest pain, wheezing or trouble breathing, seek medical attention ASAP. Trouble breathing can be a sign of bronchitis or pneumonia, while chest pain and shortness of breath could be as serious as a blood clot in your lungs. Body aches are more inline with the flu than a cold. If you have all-over body aches, fatigue and chills, you’re likely dealing with flu symptoms, not just the common cold. With the common cold, you should usually feel better after 4 days if you make an effort to get proper rest, remain hydrated, and try a couple of cold remedies. It’s normal for a cough or post-nasal drip to persist a little longer, but your other symptoms should go away. If they continue, make an appointment with your doctor as it could be something more serious like the flu or mono. 1. Dandelion. Dandelion is one of the best detoxifiers there is, and works wonders as a natural cure for a cold. It helps clean out toxins, reducing inflammation and boosting your immune system so you feel better faster! Try dandelion root tea as an amazing natural remedy. 2. Ginger. Ginger is an amazing anti-inflammatory and has been traditionally used for cold prevention. You can use it to warm up your body, helping eliminate the cold from your system. 3. Turmeric. Turmeric is pretty much a one stop shop when it comes to health needs, including a natural cold medicine. It has amazing anti-inflammatory and antioxidant properties, helping to dominate your cold quick! 4. Oregano Oil. My dad is all over us to get on oregano oil when we’re sick, and I have to say, even though it tastes awful it really does work! It’s a potent antibiotic that diffuses your symptoms pretty darn quick. You can use a few drops of oil of oregano in a smoothie or water, but I like to take it right under my tongue and wash it down with orange juice. Caution: You will feel the sting! 5. Zinc. When you’re choosing cough drops for your cold, make sure to pick ones with zinc! Zinc lozenges can cut the duration of your cold down by a few days and can also shorten the duration of your pesky cough! 1. Breathe in Steam. Boil a pot of water on the stove. Wait until the water cools to warm and breath in the steam for natural sinus relief. 2. Nasal Saline Spray. You can DIY you own nasal spray using salt water to help keep your nasal passages from drying out. Mix 3-teaspoons of non-iodized salt and one teaspoon of baking soda. Mix a teaspoon of the mixture with 8 ounces of distilled or previously boiled and cool water. You can use it with a bulb syringe, a plastic squirt bottle, or your cupped hands. 3. A warm wet towel. Breathing in the moisture from a warm, wet towel is a great natural decongestant. It will open up your nasal passages and relieve discomfort! 1. Honey. Honey has amazing antibacterial and antiviral properties, and helps relieve cough and congestion. Consume one tablespoon of honey every 3 to 4 hours for natural congestion relief. 2. Warm Fluids. Drink lots of natural teas, homemade broths and warm water. Staying hydrated thins mucus, relieving congestion in your chest. 3. Essential Oils. Essential oils can help you breath easier and loosen mucus in the chest. Use oils such as eucalyptus, peppermint and rosemary either in a diffuser or inhaled directly from the bottle. These natural remedies are sure to get your household back to health! Try them out and feel better fast! 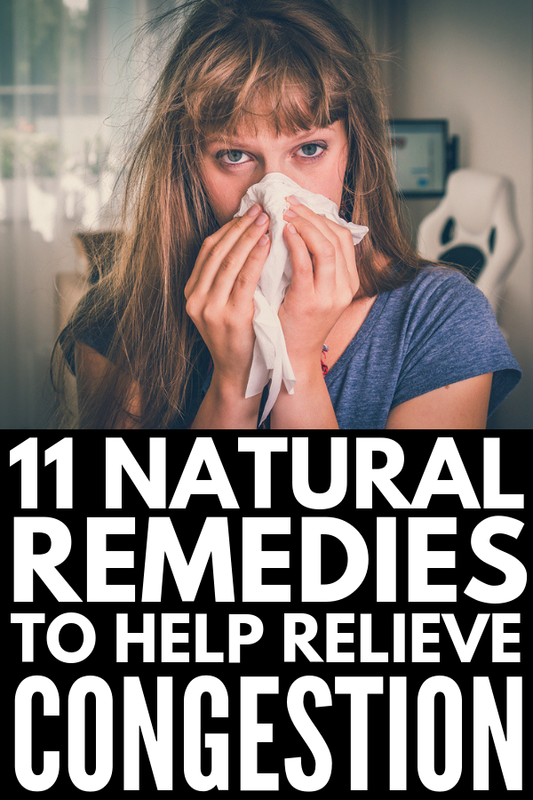 If you loved this post on natural remedies for congestion and cold relief, make sure to pin it to Pinterest! And if you want more sickness remedies, please follow our Health Board on Pinterest!